It's been three years since I last enjoyed the pleasure of Lodovico's company, and that is simply too long. You see, Marchese Lodovico Antinori is one of my favorite wine personalities, and I've always had tons of fun every time I see him. So I was really excited when I was told that Mayfair Fine Wines would be hosting another dinner featuring his wines. My friend and I were a little late to dinner at Chiu Tang (潮廳), but thankfully the cocktail session just kept going and the small group of guests were still sipping bubbly. After a warm hug from Lodovico and a round of introductions, we eventually sat down to start dinner... and more drinking! Poached sliced conches (堂灼響螺片) - I've always been too cheap to order this for myself, because I never felt I could justify the price for the enjoyment I get out of this. Yes, this was very, very good. The texture was a perfect balance between tenderness and just the right amount of crunchiness and bite. But how much are they charging per thin slice of the conch?! Served with a piece of conch liver on the side. Deep-fried oyster roll (炸蠔卷) - really yummy, actually. Very similar to what I would find in Taiwan. Deep-fried grey mullet with salt and pepper (椒鹽九肚魚) and deep-fried bean curd with Chiu Chow bean sauce (酥炸普寧荳腐) - I always thought 九肚魚 was Bombay duck, but what the hell do I know... Anyway, this was just OK. With the bean curd, I made the mistake of not taking it with any sauce, which meant it was completely bland. Savory sliced abalone with homemade soy sauce (涼拌鮑片) - a little tough and chewy, but I guess that's what happens to abalone when you have it cold and overcook it. Deep-fried jumbo marbled sand goby with premium soy sauce (油浸野生筍殼皇) - oh this was very, very good. Deep-fried crispy chicken with shrimp mousse and cabbage (窩貼小棠菜百花雞) - very yum. Deep-fried shrimp mousse is always good, and I love the crunchy exterior. Stewed pork rib with plum sauce (潮陽梅膏骨) - what's not to like about this?! It's sweet and sour pork! Wok-fried sliced beef with satay sauce on crispy vermicelli (沙茶牛肉煎米粉) - delicious as always. Rich, tasty gravy with vermicelli that's pan-fried until crispy. Works every time. Sautéed string beans with minced pork (干扁四季豆) - one of the better versions I've had in Hong Kong, and I dig that the dried shrimps came whole and not chopped into pieces. Pan-fried e-fu noodles with vinegar and sugar (糖醋乾燒伊麵) - always so good here... Noodles pan-fried till it's browned and crispy on one side while still moist on the other. Sprinkle with a little sugar, drizzle a few drops of vinegar, and voila! Instant happiness. Trio Chiu Tang Homemade Dessert (潮式美點三重奏) - my favorite of the trio has got to be the muscovado sponge cake (黑糖糕) on the left, which is just like the white sugar sponge cake (白糖糕) that you see on the streets, except better. Very, very good food. Except for the abalone, I can't find fault with any dish tonight. Thoroughly enjoyable. But we were mainly here for the wines, and it would be so interesting to see how some of wines have evolved over the last few years. 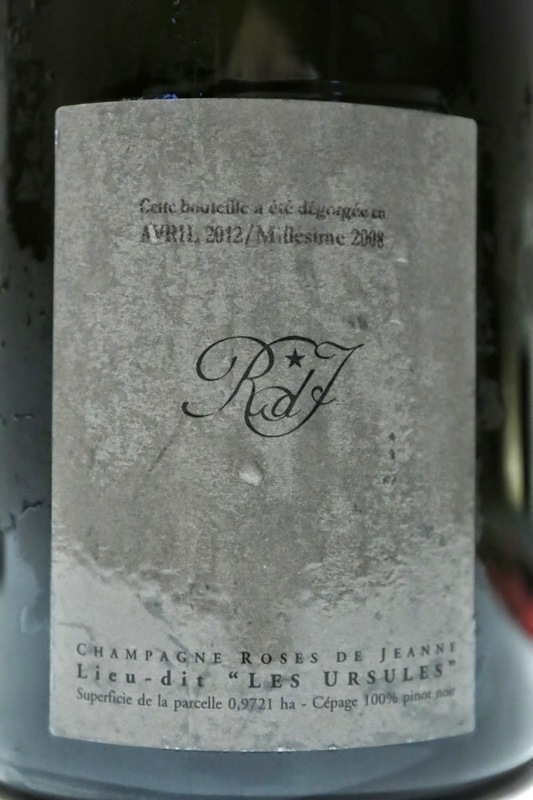 2008 Roses de Jeanne Blanc de Noirs Lieu-dit "Les Ursules", dégorgée en Avril 2012 - nice and toasty. Very fragrant, caramelized and nutty. Ripe on the palate but also acidic mid-palate. 2011 Ram's Hill - really awesome, showing big nose of muscat grapes, really fragrant and tropical, with lots of lychees and floral notes, a little pear, flinty, a little pungent - perhaps from the sulfur? Full-bodied, too. Once again shows me why this is one of my favorite Sauvignon Blancs. 2006 Biserno - still a whiff of alcohol in the nose, with potpourri, dried herbs, a little coconut, exotic, sweet and ripe. Pretty nice. Later on showed a slight hint of Chinese medicine, and at the end it fell apart and was a little dusty and chalky. 2007 Biserno - a little minty, potpourri, a little closed, nice and plenty of fruit here, and the structure is there. Showing better than 3 years ago. 2008 Biserno - a little closed, a little more brett here, and still some tannins. Later on some ripe fruits came through. 2010 Biserno - showing better than the 2008 tonight. Tannins are still here but not harsh. Still pretty young. 2007 Lodovico - very lovely, a little minty but could have had a tad more fruit initially. Later on some ripeness began to show, and some toasty notes came out. Showing better than 3 years ago, but somehow still not at the level when it blew me away 4 years ago. 2008 Lodovico - a little plastic and a little oaky. A hint of pungent sulfur. Nice overall with minty notes. Later on the wine opened up more. 2011 Lodovico - lots of potpourri, dried herbs and still a little alcoholic on the nose. Palate was really beautiful. Nice and sweet fruits, and a little exotic. 2003 Baron Bornemisza Tokaji Aszu 6 Puttonyos - honey, nutty, very ripe and sweet, slight botrytis. What an evening! I have always enjoyed it whenever I've been privileged to share Lodovico's company, and watch as his new projects mature and reach new heights. Looking forward to seeing him again soon.